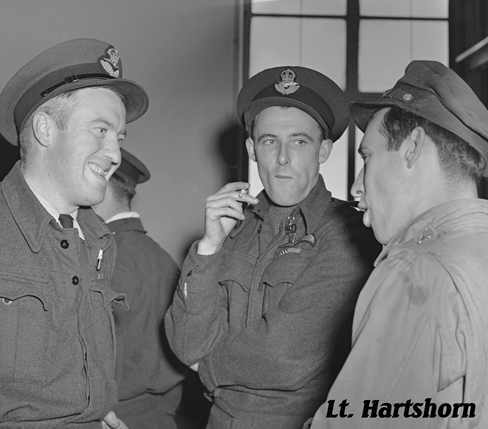 Joseph Hartshorn joined the RCAF in July 1941 four months before the United States entered the war. On May 2nd wearing the single silver bar of a First Lieutenant he was posted to 419 Moose Squadron. Described by those who knew him as "Quite colourful" and a very fine man. He like so many other pilots in training, wanted to fly a Spitfire, after completing his training at No. 10 SFTS in Dauphin Manitoba flying the Cessna Crane, which he described as being "a lovely twin-engined aircraft" Hartshorn could see that his future was directed in the multi-engine aircraft. His flying abilities must have been better then he let on in interviews as he was selected to be posted to Flying Instructor School at Vulcan Alberta. This led to his posting at No. 9 SFTS at Centralia Ontario. The dual engine Anson was the aircraft used in training here so after 40 minutes dual training he was on his own. A fellow pilot who he had known from ETS training days joined him on a "Test" flight. Centralia is located near Lake Huron so Hartshorn and his friend P/O Andy Wakemen flew North up to Sarnia Ontario where they decided that the bridge between Port Huron Michigan and Sarnia would be the target of their flying skills. Flying under bridge spans was not a recommended practice and could lead to being discharged or death. So they dived under the bridge, only to find that two Lakers were steaming under the bridge at the same time, leaving them little room to complete the maneuver! Which they managed to do and quickly escape before someone could get the aircrafts registration numbers. 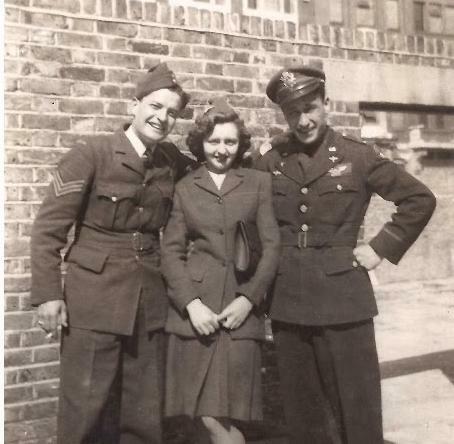 By July of 1943 it was his turn to be posted overseas, his humorous recollection of how the choice of which instructors were to be sent overseas was based on who was the most "upsetting" to the base commander. Arriving at the main RCAF depot in Bournemouth he met up with Sgt. Joseph Bachand and a friend, Bachard would also be posted to 419 squadron. While still with the RCAF he was flying Wellingtons at the OTU, attended Battle school and the HCU to learn to fly the Halifax bomber. He then transferred to the Eighth Air Force, USAAF only to be attached to the RAF who attached him to RCAF No. 6 Group, 419 squadron. It had taken him almost three years from his enlisting in the RCAF to be where he had wanted to be, the front line. His own personal skills gained in instructing new pilots I feel would be a major facture in his ability to get himself and his crew through the complete tour of duty. He mentions that he was proud to have been able to train so many to fly and keep save in the dangerous skies over Europe. He also knew that at least three of those who he trained would not be coming home. 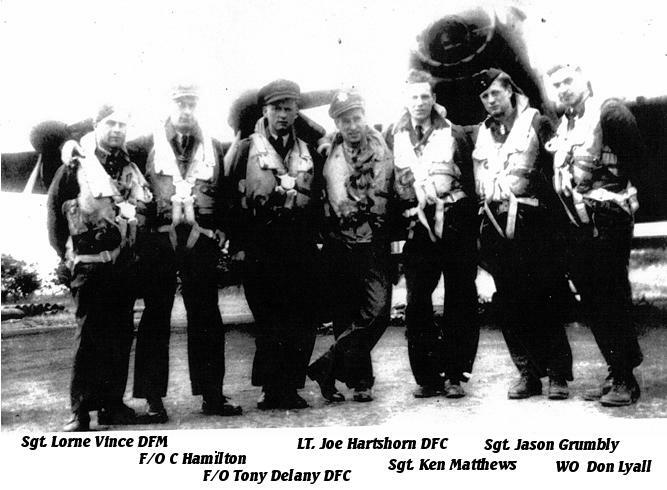 In a recent email from Ken Matthews who flew with Hartshorn on all 30 operations, he expressed the view that without Hartshorn's flying abilities and determination they may not have made it home or through the complete tour. 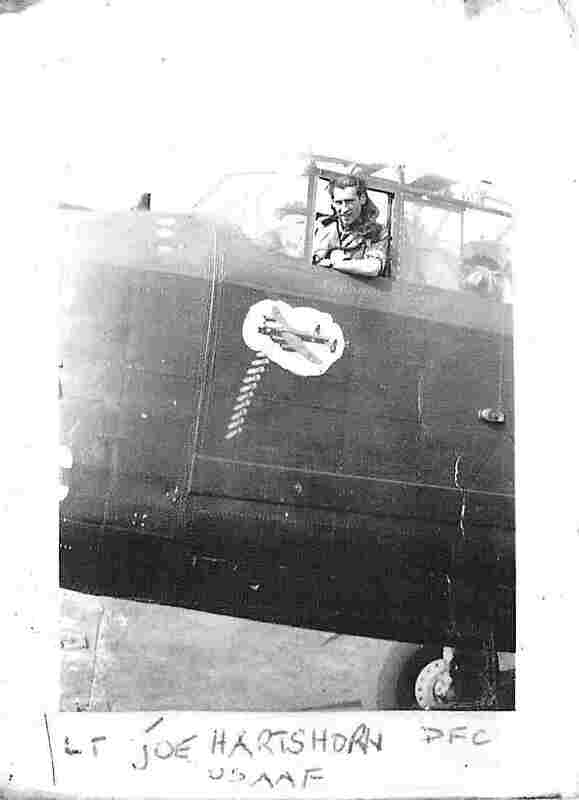 In a book published some time ago about RCAF in Bomber Command, it was reported that Capt. Hartshorn had drawn his sidearm to persuade one of his crew to obey his orders. This to me is completely INCORRECT! I asked Ken Matthews, the Flight Engineer on all of Hartshorn's operations about this, he couldn't remember any incident or a gun on board. Sitting right next to Hartshorn through all those missions, Ken would certainly know if it had happened. 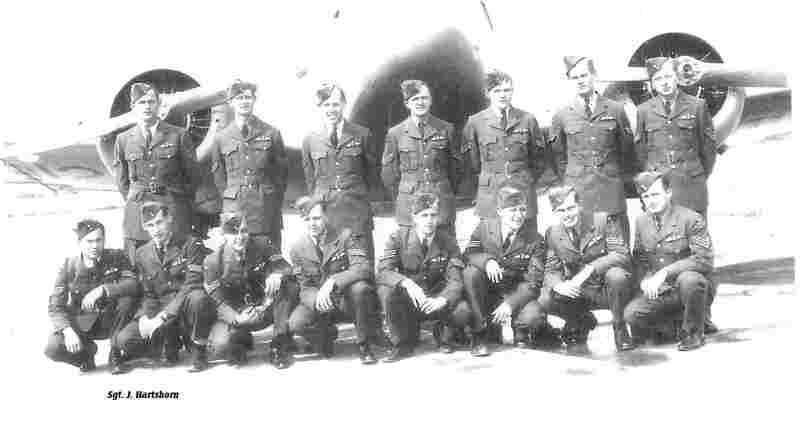 Secondly the same crew flew together for all 30 operations if this had of happened I am sure the crew member who ever it was supposed to be would have not been with them again. Lt. Hartshorn brought home the aircraft and crew to Middleton St. George without any further damage. For his actions he was awarded the DFC (immediate). On August 11 1944 he was invested by King George VI and it is believed he is the only American officer to be invested by the King while in the RCAF. 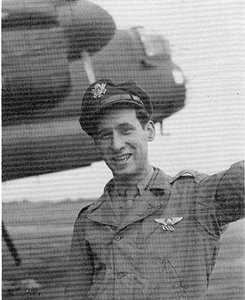 Lt. Hartshorn and crew were again attacked on the night of 29/30 1944 where a flak hit started a fire on one engine. He again managed to bring the aircraft in, this time on three engines. The aircraft survived the war and returned to Canada where it was to be part of Tiger Force. On October 12 1944 he was posted to the 12th Replacement Control Depot. He was retired from teaching at the University of Massachusetts, Amherst as a highly respected Glacial Geologist when he passed away May of 2008. University of Massachusetts has a webpage dedicated to him at http://www.geo.umass.edu/news/joe-hartshorn-memorial .